1. Is there barbeques allowed? Yes, we have barbeques in front of each yurt. You are welcome to bring your own charcoal or we will have some for sale in the honesty shed. 2. Can we have a fire pit/ build fires? We feel we do not have enough space for fires for safety reasons and would request guests do not build fires. 3. Can I bring an extra car? There is one parking space allocated for each yurt. There is one more parking space available, however please contact us to see if this is available when you book. We do not allow extra visitors on site unless contacted prior to your stay due to health and safety regulations. 4. Is there a woodburner? Yes, all the yurts have a woodburner. We will make the fire up for you before you arrive; we understand that you may have been travelling for a while and would like to make your arrival as easy as possible. You will be given a basket of wood/kindling/tinder for no extra cost, however we do provide further wood for a small charge if you need more. We will leave clear instructions for those of you who may not be used to wood burners. We also provide guards for the burners to keep little fingers safe. 5. Are children welcome? May seem a funny question, but some glamping holiday are adult only. 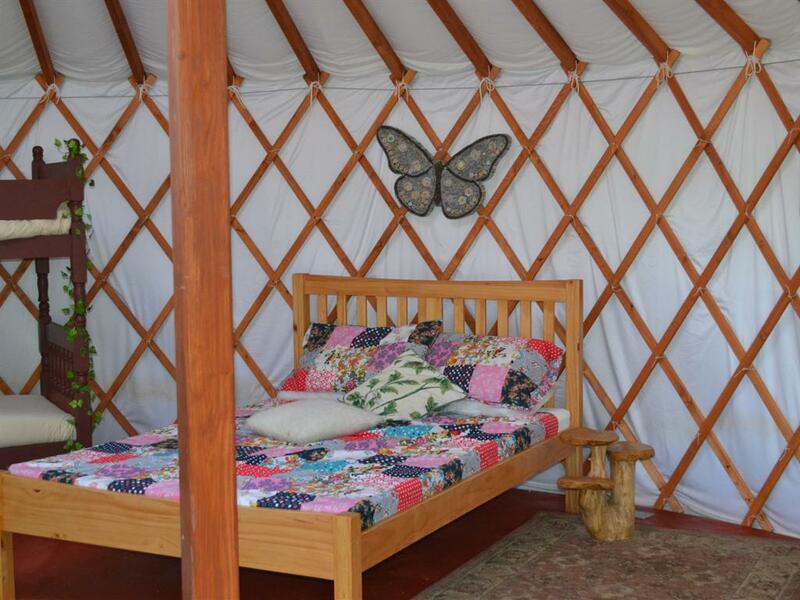 We pride ourselves on designing your accommodation with your children in mind, and have spent a lot of time making our yurts an exciting place to play and stay. We do not take adult only bookings. We also have a low noise policy on site after 8pm for the peace and quiet of all our guests. 7. Are there provisions within the yurts? We like to make an extra effort to make your stay as simple as possible. 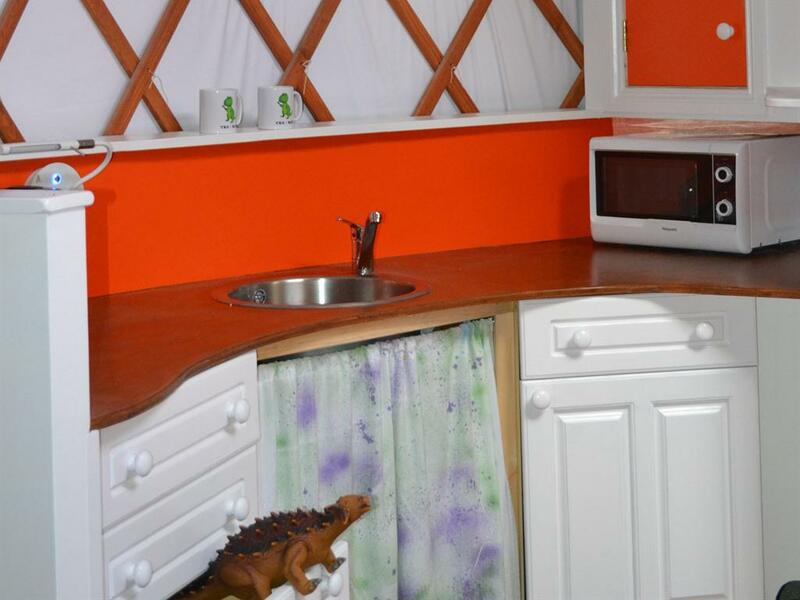 We have a fully supplied kitchen with fridge and microwave within each yurt. We will make your fire ready for when you arrive, and we will supply all bedding at no extra charge. Please bring your own towels. We do not sell food on site, but will give directions for all local supermarkets in your welcome pack. 8. Is it cold in the yurt? The Isle of Wight generally has good weather for England. However, good old British rainfall does come here too, and may make the field a bit boggy. The yurts are on wooden decking and therefore will not get rain seeping in, unlike regular camping sometimes can. The woodburner will kick out some good heat, but will need 30 mins or so in the morning to heat up. Similar to waiting for your heating to come on at home! We also provide plenty of blankets that you will find in your yurt, to cosy up during the evenings. 9. Are dogs allowed? Although we are HUGE dog lovers, we have pondered over this for a long time and made a decision not to allow dogs. We are aware that some children are not comfortable with dogs, and our chickens are free to roam around the farm. 10. What do you supply for children? We would like to make your holiday as easy as possible and understand that travelling with children can mean a lot of luggage. We will provide as much as we can to avoid this for you. We can offer additional futon, a proper cot (we are not fans of travel cots) bed guards, high chairs, non slip mats for shower, children’s eating/drinking equipment. Kids love Yurts has no hidden charges, the price you pay covers all of the above. Please let us know at the time of booking what your requirements are, and we will have it all ready upon your arrival. 11. Do I have to pay anything when I arrive? The answer is no. We have an honesty shed next to the car park where we sell eggs, chicken food, extra wood, and extra charcoal should you wish to buy anything. You are welcome to bring your own wood, charcoal if you wish. 12. Is there WiFi or TV’s? There is no WiFi connection at Kids love Yurts, and mobile phone coverage is dependent on your provider. We do not provide televisions. There are plug sockets/USB ports in the yurts should you wish to bring you own recorded devices. This is an opportunity to leave technology at home and de stress in nature! You are welcome to bring a radio within the yurt, please remember after 8pm to keep noise levels to a minimum as courtesy to your glamping neighbours.